Bank-vault security for your home! Keep curious "little fingers" and thieves from messing with your valuables, ammo and firearms. 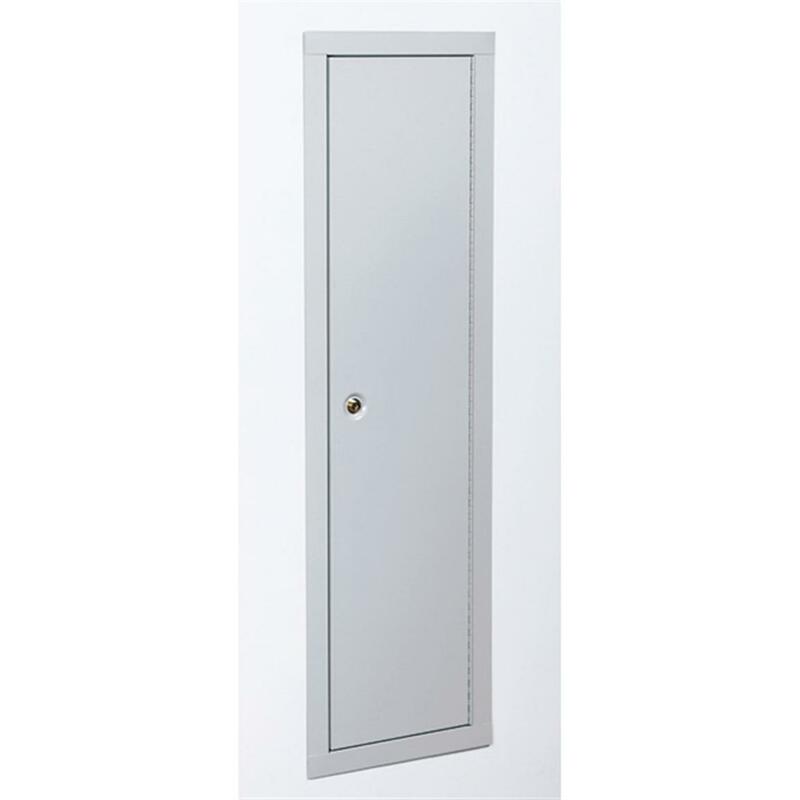 Simply get this heavy-duty, In-wall Security Cabinet by famous Stack-On. Unlike other models, this in-wall unit doesn't take up valuable floor space. Has pre-drilled holes for mounting into the wall between studs... built for standard 16" on center stud walls. Hardware is included for easy do-it-yourself installation. External size: 15.5" x 4" x 54.75"h. Inside: 14" x 3" x 53"h.
Smart in-wall storage for your home! Order now! Stack-On In-Wall Gun Cabinet is rated 4.2 out of 5 by 25. Rated 4 out of 5 by Cowboy2896 from Heavier duty than I thought Good quality, no damage. I agree with the reviewer about the screws. Had to use different mounting screws. Rated 4 out of 5 by Gunnube from Seems like a good value.. easy installation The cabinet was of bettter quality than I expected for the money. I had heard other reviews that the flange was dented but mine was well packaged and in perfect condition. One complaint I have is the stainless mounting screws were of poor quality. They are large and require some force to drive into predrilled holes, and the Phillips heads were malformed not fitting any screwdriver on this planet. Rated 4 out of 5 by ABQ Sammy from Arrived promptly, easy install The item arrived promptly. Installation was fairly easy. The screws to hold internal shelves were too small for pre-drilled holes, but I drilled better holes. Total install time was an hr. The unit seems sturdy and well built. Room for 2 rifles, a handgun and several boxes of ammo. Rated 4 out of 5 by papa from Neat The Stack-on unite is very nice. Easy to install. But I had a problem with the lock, which the company took care of right away. Rated 4 out of 5 by KGFL from Great price for a good gun cabinet Cabinet arrived with one damaged corner, as described in other reviews. Installation was easy. Cabinet securely locks with three bars. The key/lock works smoothly. I am glad I bought it at a great price. Rated 4 out of 5 by M Cundiff from Well Built/Heavy Gauge Good quality! 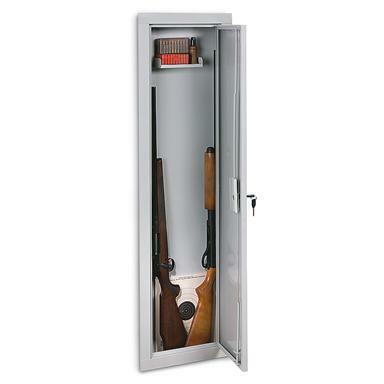 Easy to install/mount between the studs, Paneled w a hinge right over it and now its a hide away gun storage locker. Only issue was it came in dented in on the corners. Rated 5 out of 5 by Pool from Great price Very easy to install, great locking system and looks great in the wall. Rated 5 out of 5 by Katied from Gun Cabinet Just what I've been looking for. Small and easily accessible when I need it.